Gaza City – Dr. Ayman al-Sahbani rushed to attend to eight people, including two children, in the emergency ward of Al-Shifa hospital. 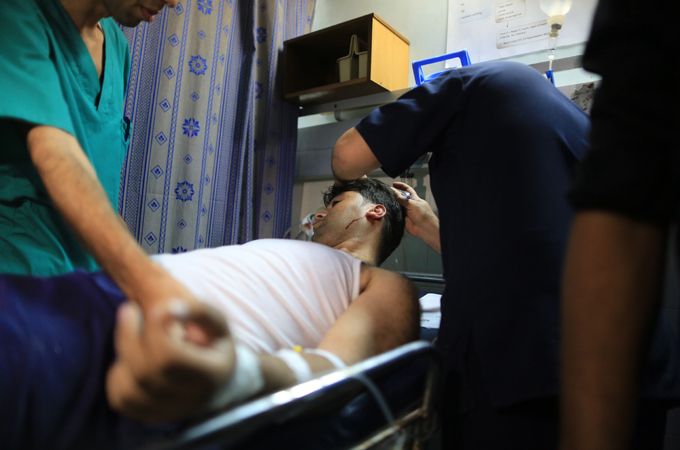 With most suffering from shrapnel wounds, the injured came to Gaza’s primary and largest hospital after an Israeli air strike hit eastern Gaza City. “Thank [God] their injuries are minor,” Sahbani, the head of the hospital’s emergency services, told Al Jazeera. As Israel continues to pound Gaza with air strikes – carrying out 50 bombings overnight and more throughout the day on Tuesday – Sahbani expressed concern about the capacity of the territory’s hospitals to attend to the many injured. As of early evening on Tuesday, at least 12 Palestinians had been killed in the Israeli bombardment. More than 80 others were wounded, according to a Gaza health ministry spokesperson, including more than 25 that had serious injuries. He added that the closure of smuggling tunnels between Gaza and Egypt – the main lifeline through which medical supplies were brought into Gaza during Israel’s last major offensive in November 2012 – and the closure of the Rafah border crossing have exacerbated the problem. Gaza also suffers from a shortage of medicine and medical supplies, Gaza’s Health Ministry spokesman, Ashraf al-Qedra, told Al Jazeera. Gaza is completely missing about 30 percent of essential drugs, while 15 percent of the remainder is expected to be exhausted within days of an Israeli assault, he said. “The medical services are in a very critical situation that we have never reached during the [Egyptian-Israeli] siege,” Qedra said, adding that the ministry is running “extremely short” on items like gloves, urine catheters, and other medical equipment. Qedra said that the ministry has appealed to the Palestinian consensus government, which was formed last month, to help. “We are surprised that the government has not reacted so far to rescue the healthcare system,” he said. The persistent fuel crisis in Gaza, which leads to frequent electricity cuts, also puts patients at risk, especially those who rely on incubators and dialysis machines, and are admitted to emergency departments. “In the past, we used to have a crisis in one field, not crises on all levels like today,” Dr. Sahbani said.